Set in the thick misty Virunga Mountains jungles, the 3 Days Gorilla Trekking Safari is a jungle safari promising to change your whole experience of African Safari. 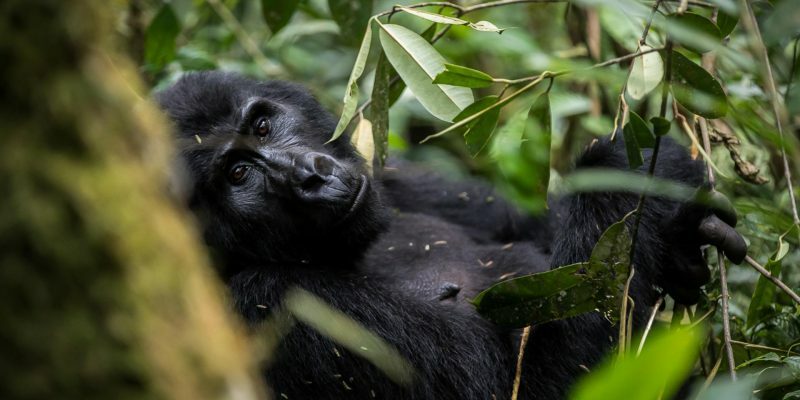 Prepare to take a picturesque country ride from Entebbe to Bwindi Impenetrable Forest National Park where you’ll be guided into the habitat of a selected gorilla family and once found, spend a full hour among the mountain gorilla family understanding how they eat, eat, communicate and feel. This experience in non-comparable to any other travel experience, so come with a camera or friend and share the experience. Our Uganda Gorilla Safari guide will meet you and brief you about your tour. You will later be driven in comfortable and secure touring vehicle to Bwindi Impenetrable National Park in the south-West of Kampala. Stop-over at the Equator for photographic opportunity as well as an enjoyable and informative talk. There is an experiment done here to prove to you that it is surely the equator. Have Lunch in en route and then proceed through the Kigezi Highlands a scenic drive! You will continue through the banana plantations and then you reach the views of the great Virunga volcanoes of Rwanda and the Congo as well as heads of Ankole long horned cattle then to the biggest Home of mountain gorillas which is the Bwindi Impenetrable Forest. Today is the Uganda Gorilla Safari adrenaline adventure day – gorilla trekking to meet the magnificent mountain gorillas. After breakfast, proceed for the morning briefing before enjoying the highlight of the trip- Gorilla trekking, which may last the entire day. We trek through the rainforest and bamboo covered slopes, accompanied by a guide and trackers, in search of a mountain gorilla family. The walking can sometimes be tough and long, but when you catch a glimpse of the magnificent silverback, any discomforts will be quickly forgotten. When sighted, visitors will be guided to within 6 metres from the mountain gorillas, sit around them for a whole hour while gazing into their big round eyes. Gorilla trekking is unpredictable. It’s difficult to foresee how many hours you will hike. The gorilla excursion can take from 2 up to 8 hours. Expect to walk along distance in steep and muddy conditions, sometimes with rain overhead, before you encounter any gorillas. A good physical condition is recommended. For conservation purposes, time spent with the gorillas is limited to one hour. A ranger will brief you on how to behave with the gorillas. After this tour, in the evening you can relax around a campfire, take walks or retire to the lodge. Have an early morning breakfast before you leave Bwindi Impenetrable National park for the Kigezi highlands (The Switzerland of Africa). From here, regroup at the camp before leaving for Kampala, having lunch along the way.